Christopher Carosa is an investment advisor by day, but an author by night. The author of two books on investing, a hilarious stage play, and more than 400 articles on every subject under the sun has now published a book that reveals 50 underexposed treasures that our region offers. 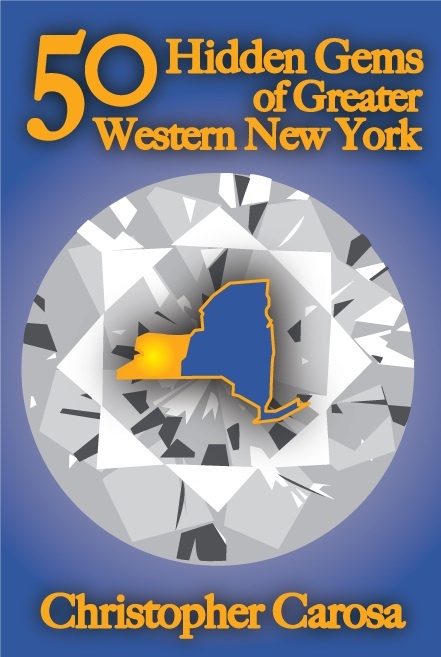 The new book, appropriately titled 50 Hidden Gems of Greater Western New York, is written in a style that goes far beyond presenting mere historical facts. It is written in a light-hearted, entertaining, witty style that will give the reader chuckles, as well as a wealth of facts about our area. One story actually reveals the secret to the elusive boundary of Greater Western New York, and how that not so imaginary line came about. A controversial early-American whose actions led directly to the creation of the U.S. Constitution. Our region’s claim to be the origin of America’s favorite fast food (and, no, we’re not talking Buffalo Wings). The home of the Grand Canyon of the East. The fascinating story of the mysterious Lost Tribe of Western New York. A Rochester-born woman who holds this Hollywood first – that almost wasn’t. The eerie tragedy behind New York State’s smallest town. The time a small Western New York hamlet seceded from the union – and the ensuing oversight. How the bumbling of the British Monarchy helped mark the borders of Greater Western New York. The author is a real renaissance man. He earned a degree in physics and astronomy at Yale. Today, however, he concentrates most of his stargazing time watching the rise to stardom of Greater Western New York businesses. He then shares that insight with clients as president of the Bullfinch Fund and its investment advisor, Carosa Stanton Asset Management, L.L.C. 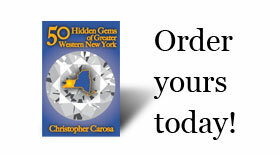 Carosa plans to introduce the book via speaking engagements before service clubs and other organizations in Greater Western New York. Organizations wishing to book speaking engagements can contact Duane Pancoast at 585.924.4570 or duane@thepancoastconcern.com. 50 Hidden Gems of Greater Western New York retails for $24.95 from Amazon.com or from GreaterWesternNewYork.com or catch the video trailer and sneak preview at 50HiddenGems.com.